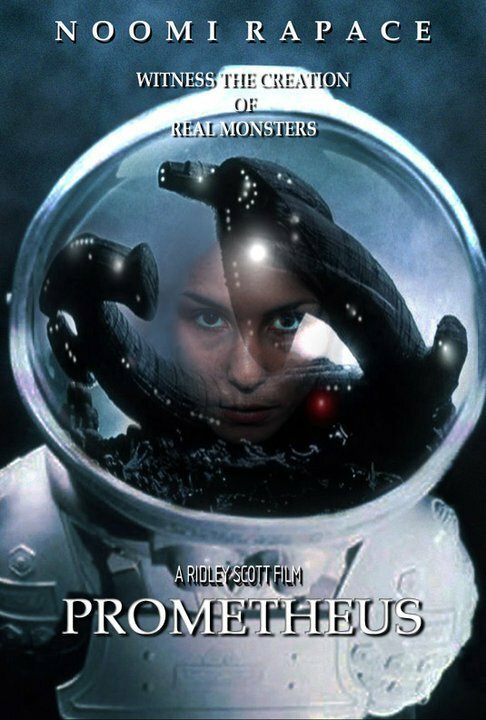 I was originally going to give 3 stars to Prometheus for a film with outstanding cinematography and art direction (as with most films by Ridley Scott), but without sympathetic characters who had virtually no chemistry. After much reflection, though, the horrible science and multiple loose ends forced me to downgrade my rating. I can forgive the unanswered questions about the motives and biology of the aliens in Prometheus. After all, they’re aliens! What I can’t forgive is the awful, awful protocols shown by the human scientists, technicians, and spaceship crew throughout the movie. To begin with, a legitimate scientific expedition would have started by releasing weather and observation satellites to orbit the planetoid for weeks, perhaps months before Prometheus ever landed. This would determine the most likely places to hunt for aliens, rather than just luckily finding alien structures. Then, the small, remote-controlled probes would be sent into the alien installations to map them thoroughly and take air and soil samples. When pictures of the dead aliens came back, the scientist would spend many hours determining likely scenarios and procedures to avoid a similar fate before setting a foot inside. The biggest mistake the movie makes, though, is something I haven’t seen discussed anywhere. People have written about the folly of the crew taking off their space suit helmets without checking for microbes or other contaminants. It’s not just the air quality that could cause illness or injury. What hasn’t been mentioned is the danger of the humans contaminating the alien environment. Good scientists are concerned to the point of paranoia about destroying a pristine environment and invalidating their results. This is why Mars rovers are sterilized before they leave Earth. Once an alien planet is contaminated, there’s no way to know what’s alien and what’s not. The crew of Prometheus would have to undergo rigorous decontamination procedures both when exiting the ship and on their return. Another question that I haven’t seen discussed elsewhere is why would an expedition as well-financed and equipped as Prometheus not have more than one robot? Weyland would want to have as much redundancy as possible to maximize success. Moreover, the humans would need to be cross trained, just as astronauts are now, so that in case of injury or illness there would be someone to fill in the gaps. This goes for the scientists, flight crew, security, and every other function. Wouldn’t Prometheus be crewed with the absolute best people in every role? People who knew what the mission was and who had trained together for months before leaving Earth. There is no excuse for second-best in a first-contact mission that’s exploring a dangerous alien world. It’s one thing to have a haunted-house movie filled with naïve teenagers, but it’s quite another to see supposed top scientists do dumb things. With a little more thought, Prometheus could have addressed the plot holes I and others have noted, and as a result been a tighter film with more tension and surprises. This entry was posted in Movies, Science Fiction and tagged Damon Lindelof, Jon Spaihts, movies, Prometheus, Ridley Scott, science fiction. Bookmark the permalink. Prometheus has been pretty polarizing, with viewers either enjoying it, or being drastically, painfully disappointed by it. you and me? we’re in the same boat on this movie. it wasn’t even so bad it was good, it was just, bad.